One of my favorite blogs, BooMama, is having a little meeting of the blog minds over soup. And recipes. So I thought I’d put my favorite out here. My friends ate this about 14 times last winter- whenever a group came over, I was chopping ham. The Publix deli guy was convinced I had a crush on him. No such luck, bald old guy. This is my godmother Earlene’s recipe. She’s good, y’all. Like this soup. And I have no idea who Hoppin’ John is (or was), so you could really call it Hoppin’ Annie soup if you so desire. As a matter of fact…. Stir in flour when sauteed. Coat onion and garlic with the flour. Add Rotel tomatoes and about ½ of can of chicken broth. Process one can of peas in blender or food processor until creamy. Add to mixture. Add remaining can of whole peas. Stir and simmer about 20 minutes. Add remaining chicken broth as needed for desired soup thickness. Serve over a scoop of cooked rice. Garnish with a dollop of sour cream and chopped green onions. Seems to me that a good slice or stick of corn bread would go well with this. How right you are, Earlene. Cornbread is delicious. Try the recipe and let me know what y’all think. 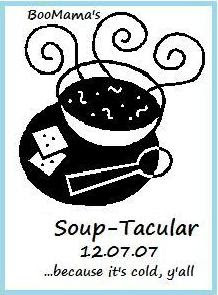 And you can click over to BooMama and see 100+ other soup recipes. So whatever you were going to do tonight, cancel it. There is soup to be had.